I had an insight a few years ago when I was working with managers and leaders. During their planning away-days I noticed that when they were working in a group and had one hour to address a challenge, nothing much happened until I opened the door of their room and said – 10 minutes to go. Then there was a flurry of activity, ideas and energy. In next to no time the group often generated some amazing ideas. How much time did an individual or group really needed to start solving a problem? Through trial and error and thousands of people in my workshops I found the answer. In this 2 minutes the individual or group member has to try and create 9 new ideas in 2 minutes. I called this – The Magic Formula. The starting step was one of 5 (i.e. start, enhance, connect, evaluate and action). The new approach I called Speed Thinking (I then wrote a book about this – the Chinese version has just come out). And the tool became Ideas Blitz. People are often amazed at what they can do in a short period of time. They can truly brainstorm big, new ideas — in minutes. Even the people who claim they are not creative are awash with ideas. I believe what stops most people from being as creative as they possible can is their own internal voice. What if i am wrong? or What if I make a mistake etc. Ideas Blitz with the starting magic formula does not give people time to filter their rich, raw ideas. Then the group (or an idea partner) can enhance, connect, evaluate and action — in minutes. 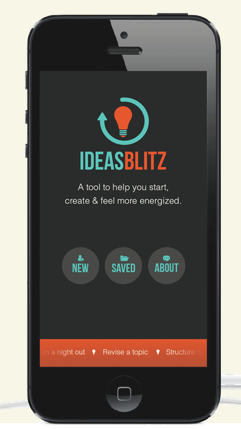 Ideas Blitz can be used in any brainstorming sessions or in The Small Wins Way 5 step process. Or if you just have a few minutes and you need to solve a problem quickly you can just grab a few people and Just Blitz it!